Create a bend with Acute Angle Tooling in the metal, 30° is preferable but 45° will work for some circumstances. Place the acute bend under a flattening bar and apply enough pressure to finish closing the bend. The first step is done the same as any regular acute angle bend. The second stage of the hemming process requires some additional know how on the part of the Brake Press operator and tool designer because the angle of the sheet metal, the flattening bar wants to slide down and away from the sheet metal. In addition the work piece wants to slide out from between the bars. These two forces are known as thrust forces. This requires that the flattening die be designed to withstand the thrust forces and remain flat. In addition it requires that the operator put a forward force against the sheet metal to prevent it from sliding out of the die. These forces are most prominent on thicker work pieces with shorter flanges. With these factors in mind let’s examine three of the most common forms of hemming set ups and tooling available for press brakes. The simplest form of hemming set up is combining two different setups. The first is an acute setup, where the 30° bend is created using standard tooling. Once the first bend is made the part is either transferred to another machine, or a new setup is put into the original. The second setup is a simple flattening bar. The bend is placed underneath the flattening bar and is closed. This setup doesn’t require any special tooling and may be preferable for short runs, prototypes or job shops which will need to form a variety of hem lengths. As individual pieces of Brake Press Tooling the acute tooling and flattening bar are very versatile, and add value outside of hemming. The draw backs to this system is the obvious requirement of two unique setups, as well there is no thrust control in the flattening process. 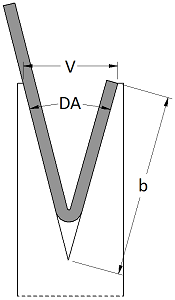 A two stage hemming die works by using a deep channeled die and an acute sword punch. The first bend uses the channel as a v opening to air form the bend. In the second stage the punch slides into the channel as the punch is closed and the edge of the punch is used to flatten the sheet metal. Seating the punch inside the die’s channel redirects the thrust force into the die, which can be more readily secured than the punch itself. The drawback for this type of die is that it practically requires a CNC control. Because of the difference in height between the stroke of the first and second stage to adjust manually would be very time consuming. In addition this type of die can be easily split from over tonnage, reinforcing the need for computer controlled safeties. The other most common form of tooling designed specifically for creating hems is a three stage, or accordion type punch and die. The v opening sits on top of a spring loaded pad, which sits over a bottom pad. In the first stage the acute bend is created in the v opening after the spring has been compressed and the upper pad is seated on the lower pad. In the second stage the upper ram is retracted and the springs between the upper and lower pad returns it to its original position. The sheet metal is then placed between the upper and lower pad and the punch is closed down transferring tonnage through the v die. Special relief is given to the v die to allow this tool on tool interaction. The guide between the upper and lower pad prevents the thrust forces from affecting the rest of the tooling. The lower die also gives the operator something to push the work piece against preventing the sheet metal from sliding out. This tool is preferred for mechanical, non CNC, brakes because the difference in stroke heights is very small, making adjustment less time consuming. This set up also allows you to use a standard acute punch. The tonnage required for hemming is going to depend on the strength of your material, its thickness and most importantly what type of hem you wish to form. The tear drop and open hems do not require nearly as much tonnage as a flat hem does. This is because you are only changing the inside radius minimally, basically you are just continuing the bend past 30°. When you flatten the metal you are forming a crease and removing the inside radius. Now you are forming the metal rather than simply bending it. Below you can see a hemming tonnage chart for cold rolled steel. Hems are commonly used to re-enforce, hide imperfections and provide a generally safer edge to handle. When a design calls for a safe, even edge the added cost of material and processing of a hem is often preferable to other edge treating processes. Designers should look beyond a single small flat hem to treat edges. Doubling a hem can create an edge perfectly safe to be handled without almost regard for the initial edge quality. Adding a hem in the ‘middle’ of a bend profile can open the doors to a variety of profiles not possible without fasteners or welding. Even without sophisticated seaming machines a combination of two hems can create strong, tight joints with little or minimal fastening. Hems can even be used to strategically double the thickness of metal in areas of a part which may require extra support. Hems used in the food service industry should almost always be closed for sanitary purposes (very difficult to clean inside the opening).